This isn’t my book, but author Alvin H. Marill asked me to write the foreword and I was happy to contribute. Marill was a fine writer and an extraordinary researcher who wrote the multi-volume Movies Made for Television encyclopedia that has been a staple of my own research since the late 1970s. Marill was very interested in music for TV and asked for an intro that focused on the fascinating history of music in TV westerns. He died in 2010, just before this — his final book — was published. 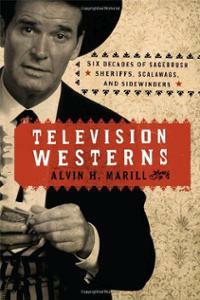 This entry was posted in Composers, Television Music and tagged Alvin H. Marill, Sagebrush Sheriffs, Scalawags, Sidewinders, Television Westerns, TV western music, TV westerns on September 1, 1994 by Jon Burlingame.